One of the tougher images to pull off at San Francisco City Hall because we are clear across the building from them. I normally have my shooting partner stationed with the couple to give them instructions. This helps because the couple can't hear me to give them feedback about how they are doing and whether I am getting the shot. This causes them to have to hold the pose a little longer than normal. In this case, it's probably OK because they are kissing. This image is further enhanced by the slight amount of back light coming through the south facing window at city hall. As you can see in the photo, the back light creates a soft rim lighting around the married couple. A subtle glow is also created in the bride's veil which also adds a little bit of drama to this wedding image. 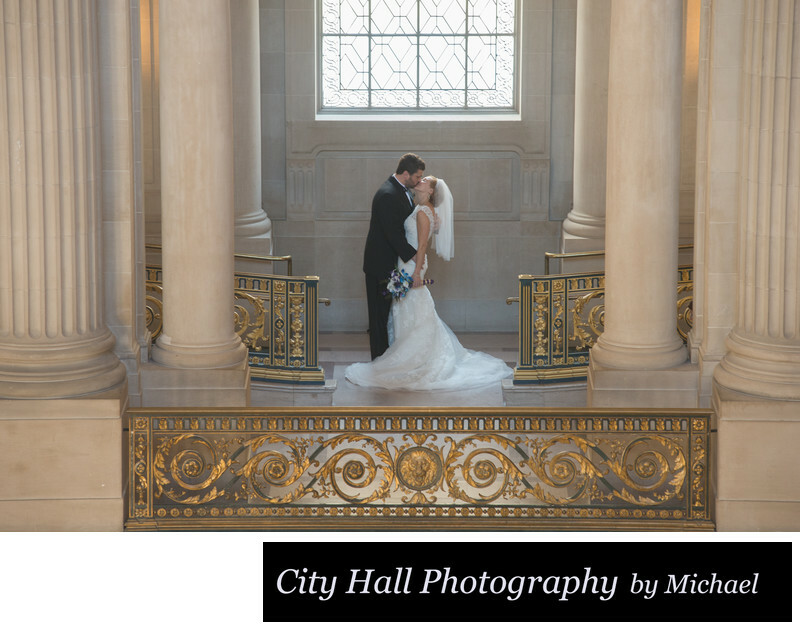 SF City Hall allows for many opportunities such as these with the huge windows and perfect light pouring in.